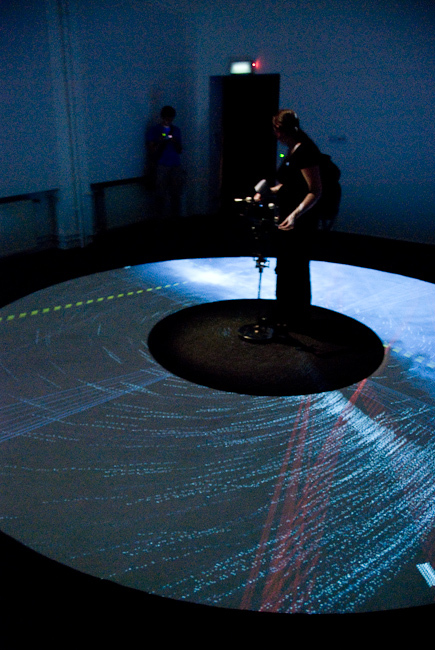 The exhibition CyberArts in the OK turned out to be one of the highlights of this year’s Ars Electronica Festival. Left: a plaything for the great observers at rest by Norimichi Hirakawa. Right: Optical Tone by Mutoh Tsutomu. Some works were kinda pointless, but beautiful, like the above pictured a plaything for the great observers at rest and Optical Tone. With a plaything for the great observers at rest one could overlap different world views – in the end just beautiful light effects in an unusual projection and a wacky input device which supposedly resembled a conceptual model of sun and earth. 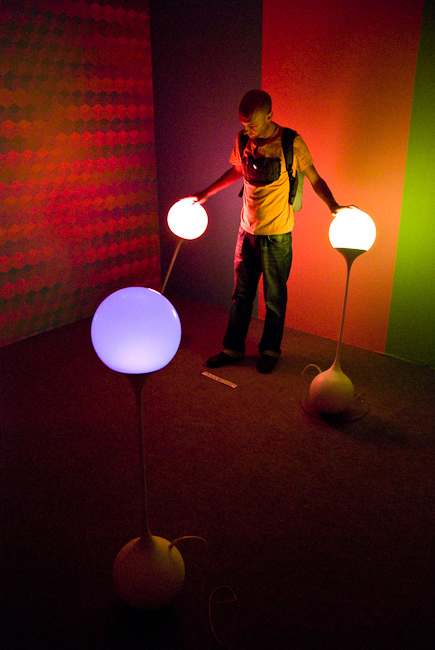 Optical Tone consisted of funny colourful lights which could be pushed around to make them change colour. Left: The Replenishing Body by Ross Phillips. 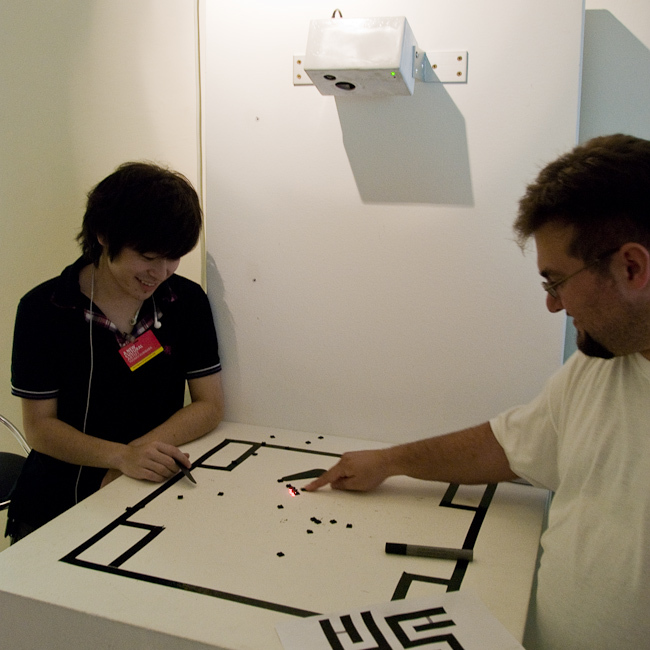 Right: Reactable by Sergi Jordà, Günter Geiger, Martin Kaltenbrunner and Marcos Alonso. 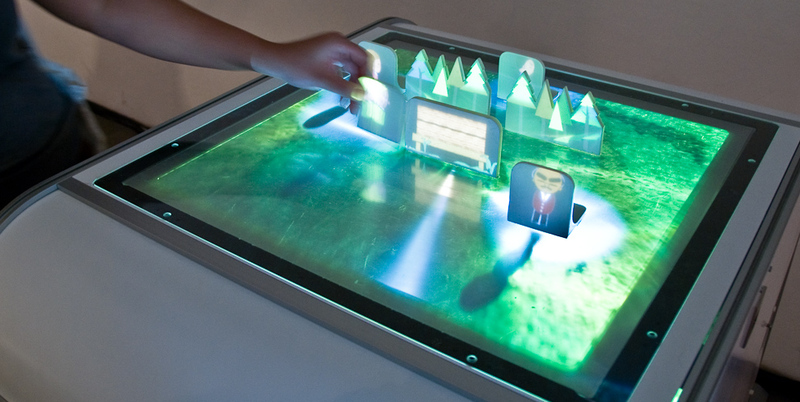 More permanently fascinating were projects like Reactable. 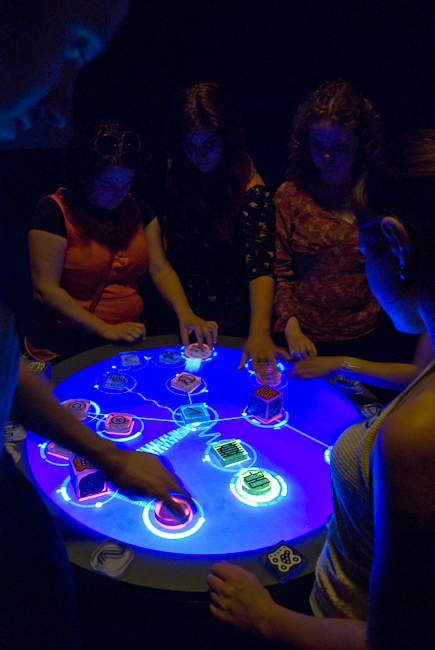 Reactable is a sort of electronic music instrument, which gathered some fame during a tour with Björk. Just like the year before, there was again a campus exhibition. This time in collaboration with the university of Tokyo which included many student projects. 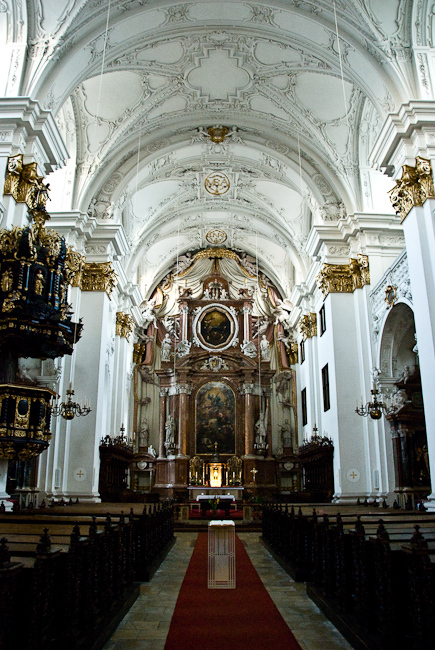 ephemeral melody, as seen above, was borderline kitschy, but still very beautiful. One could use a small crank to create soap bubbles. 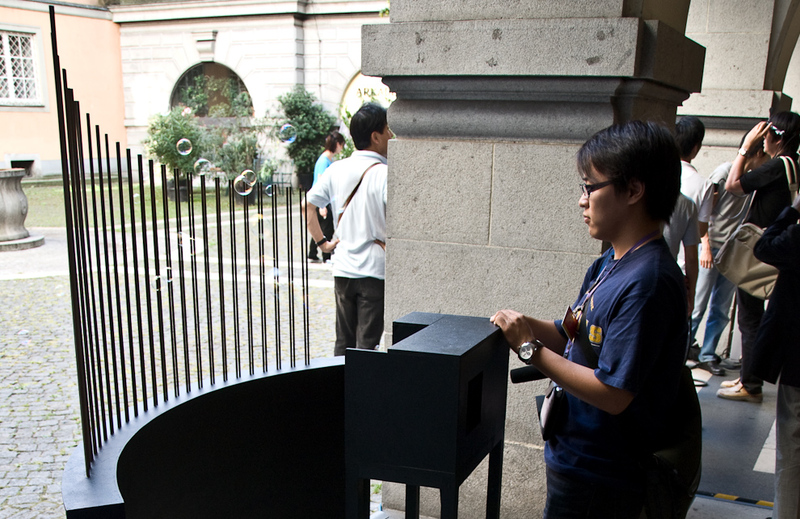 When bubbles collided with metal rods which were placed in front of the bubble-output, a sound rang. Kinda lika a soap bubble piano. Also drolly was the installation Optical Camouflage. A person with a grey coat moved up and down in front of fixed binoculars. When looking through the binoculars, one saw the above picture. 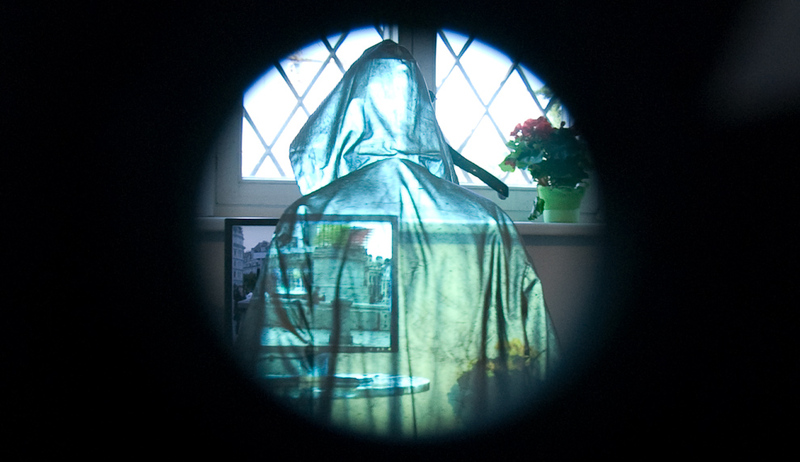 The background glimmered through the person (or, more correctly: it was projected onto him – the coat was of a material which reflected light exactly back in the direction that it came from and there was a projector built into the binoculars which projected the background right from the oberserver’s point of view). On Tablescape Plus, one could push little projection screens around. 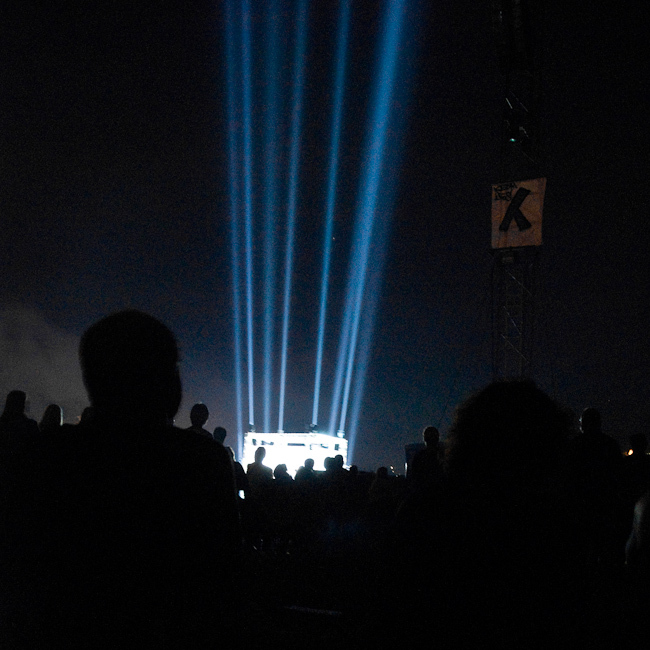 A character or object was projected onto each of those. 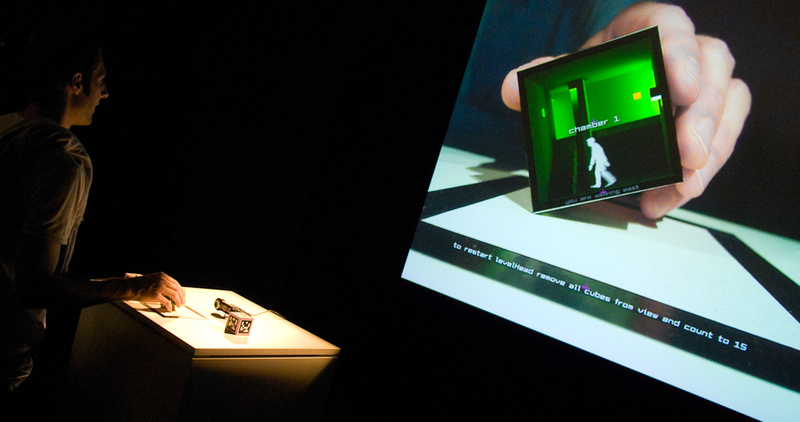 When the screens came into close proximity, the characters began interacting with each other. For example – and if I remember correctly – the male figure began arguing with the female one as soon as they were moved close to each other. 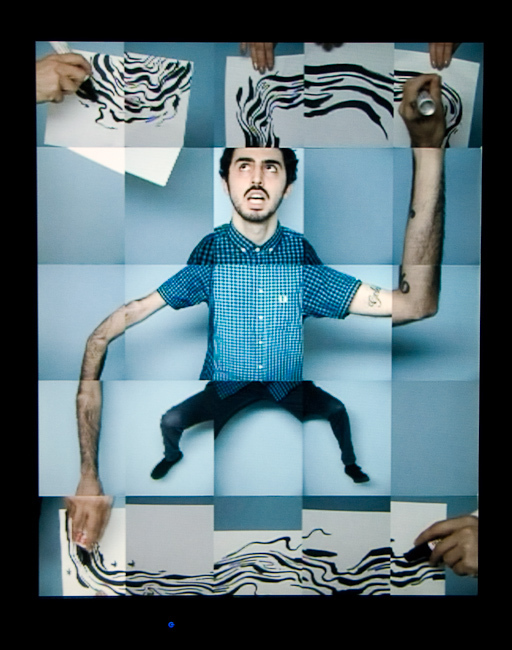 TORSO was an experiment about telepresence. One could put on a – slightly bulky – helmet and then saw through the “eyes” of a robot head next beside oneself. The movements of the helmet were tracked and the robot head copied the movement exactly to make the illusion of seeing through its eyes perfect. 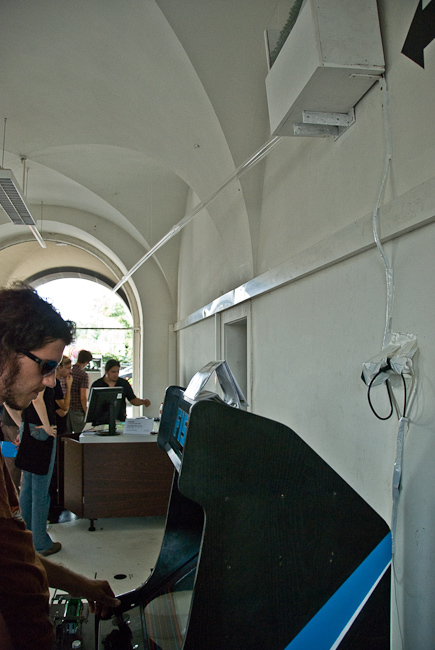 To demonstrate the realism of the effect, the supervising artist sometimes thrust a softball onto the roboter head to shock the visitor – for whom the impression was as like the ball was thrown onto himself. Erm… I better had written title and artist down for this one…. In the topmost floor there was a small setup witch projected a small laser-point onto a desk. The point always moves along any black edges on the surface. Visitors could add or remove such edges and thereby play with this living point. Unfortunately I missed to write down title and artist and also can’t find them in the official Ars Electronica Festival guide. If any of you know any details: Please leave a comment below. At the end of the day, we attended an event at the waterside of the river Donau. The event was titled Visualisierte Linzer Klangwolke which roughly translates to Visualized Sound Cloud of Linz (the German version sounds much cooler ^_^). 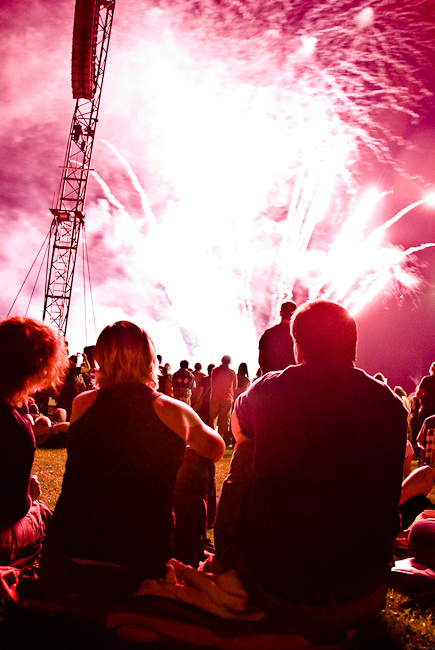 That was a pretty large event, consisting of light effects, projections and sound – basically a sexed up audio play. The light effects were impressive. 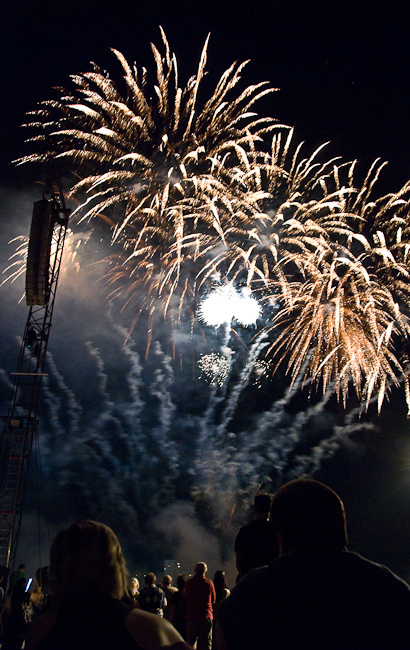 On both sides of the river were large spotlights which swung light beams through the night sky. Most ansatisfactory, though, was the story. Too much time has passed to be still able to offer a sound criticism, but in my humble opinion, story and text were often quite awful. 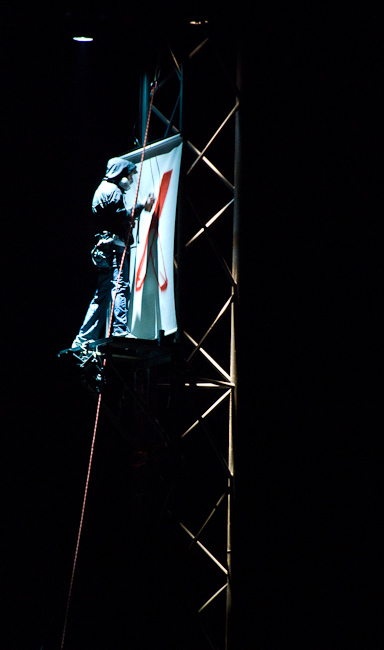 On the other hand, the use of live performances was quite cool. 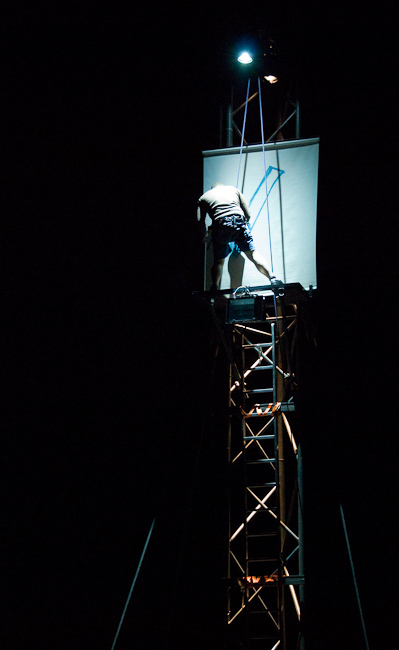 At one point, for example, several performers climbed high posts, unrolled large papers and sprayed symbols onto them. 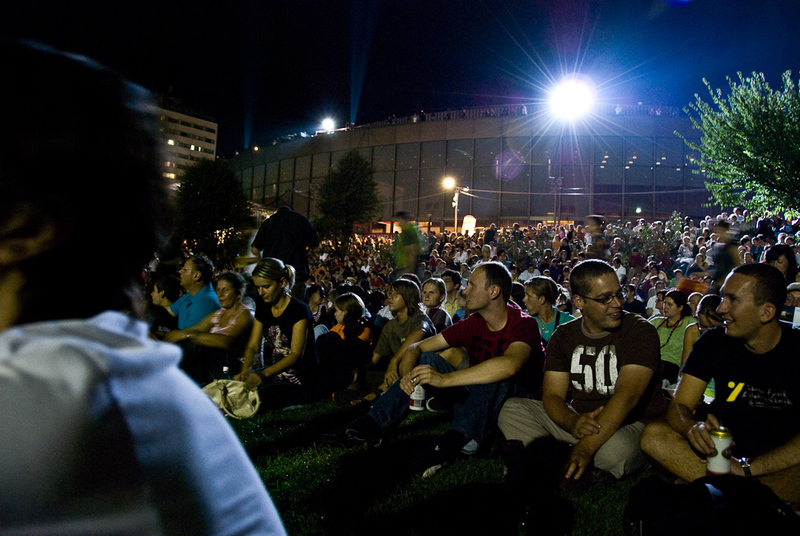 Large audience – this is only a small part of the whole mass of visitors. Oh dear, that was one crowded event! 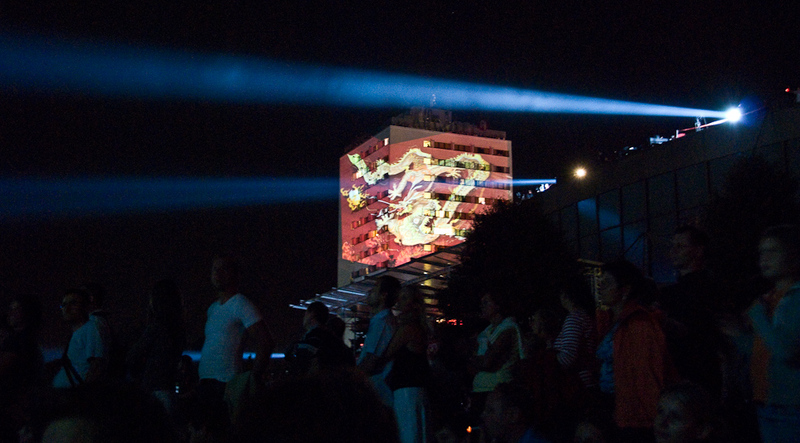 Two of several large spotlights and a building as projection screen. 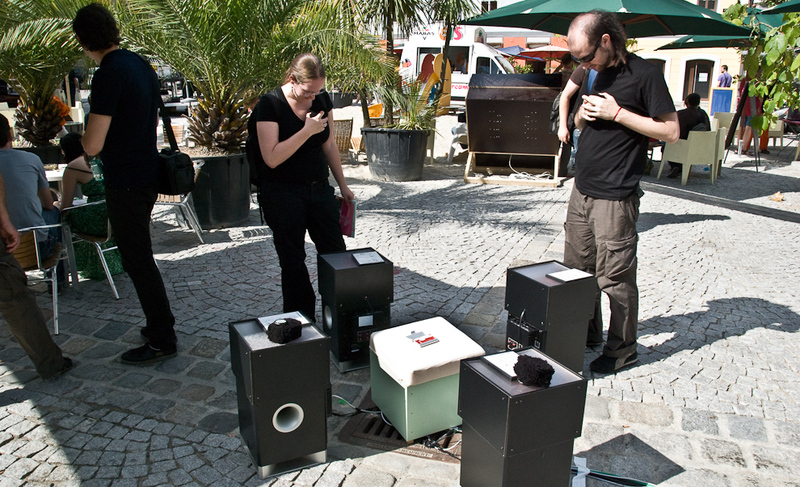 I collected a few links to more Ars Electronica 2008 resources. Feel free to add your own in the comment section below. I was here its really amazing. Thanks for providing these photos. The light effects really impressive. Nice work.